Somehow 7 weeks has ticked by on the calendar like a blink and we are packing up to come home. We aren't ready to leave but we are ready to be in our home. Bittersweet good-byes. We hope you've enjoyed our blog, we've certainly enjoyed the adventures. Easter Sunday ~ A Day at The Beach outside our apartment. We're getting used to this. 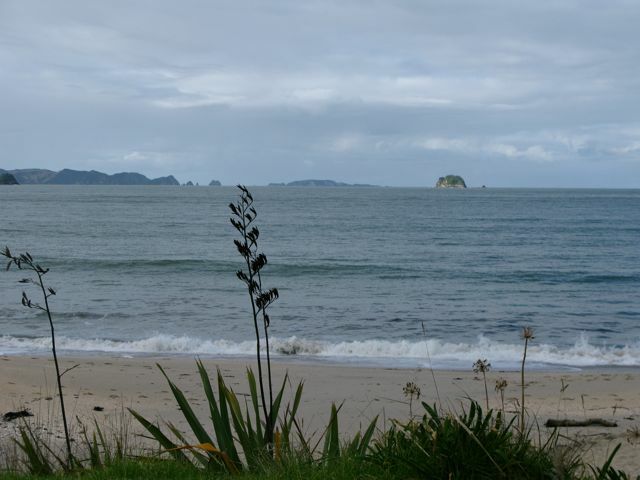 When we planned our stay on the Coromandel Peninsula we chose the east side since we knew this is where Whitianga and Cooks Beach are; the Kiwi hot spots. 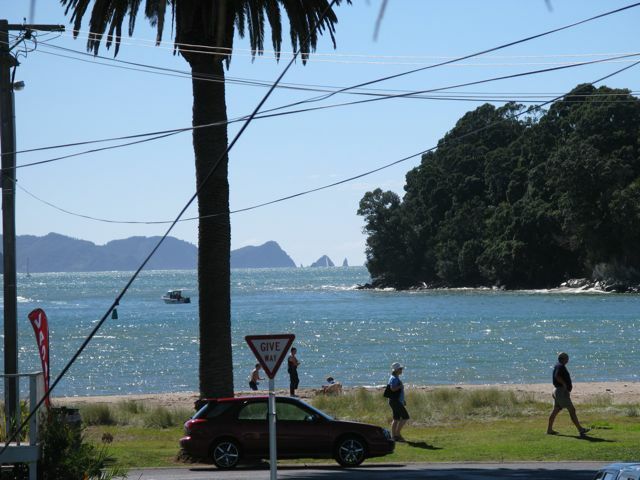 We'd heard that Coromandel Town, on the other side of the Peninsula was rough coast line and not as nice. But, we decided to take a road trip to check it out. And it was awesome. 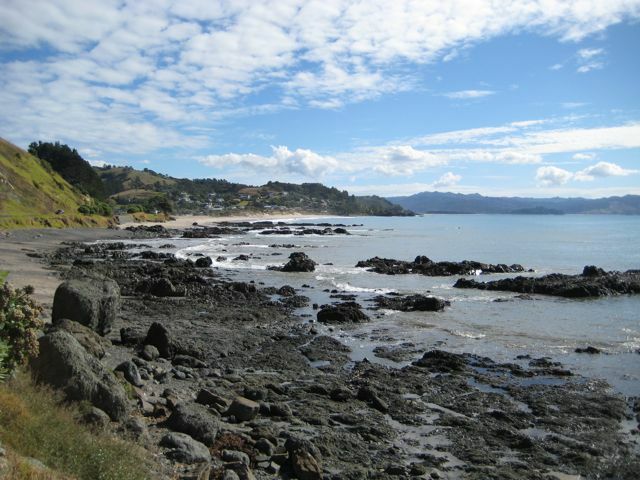 We, again, passed several beautiful beaches with very few people and then dropped into Coromandel Town with fabulous views. Check it out! The view from our apartment before we headed out. This was awesome. 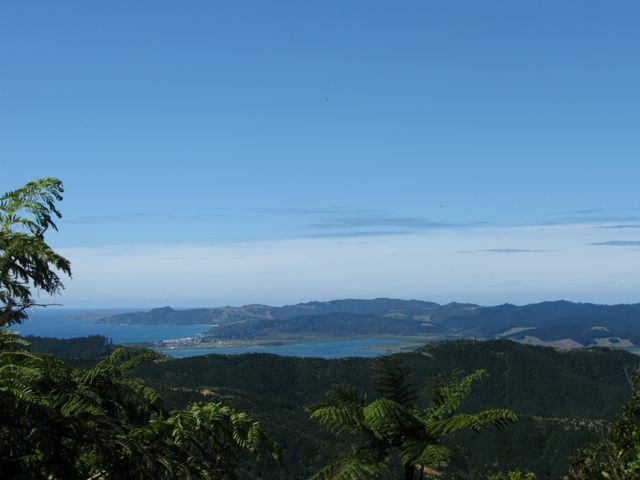 We stopped at the top of the hill and behind us (first picture) was a view of Whangapoua and in front of us (second picture) was a view of Coromandel Town. One of the best vistas of the trip! 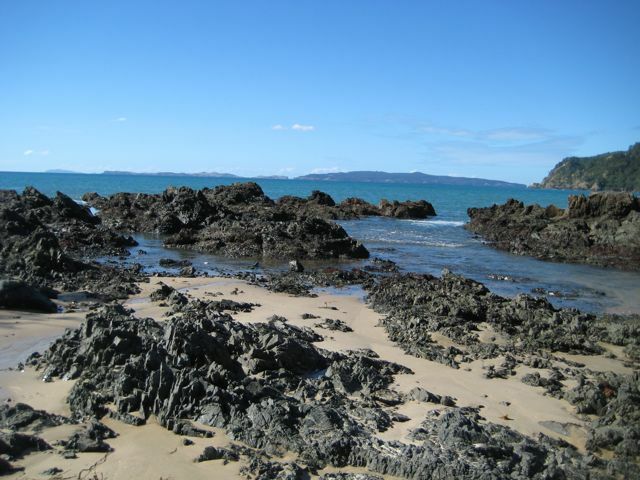 On the way back we stopped at a few beaches along Whangapoua Bay. Awesome! 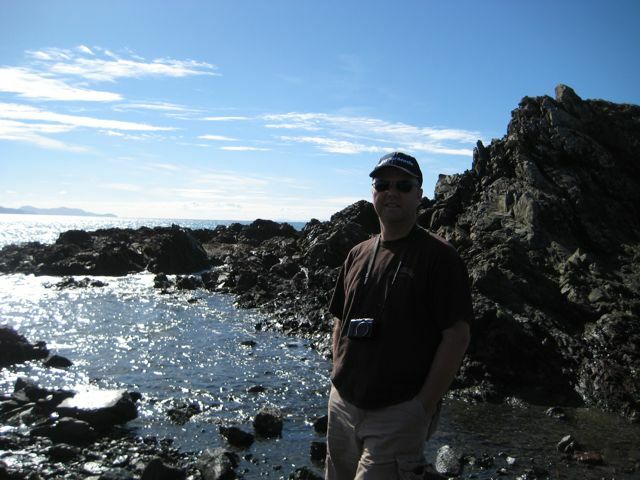 Standing on the rocks; the view to the left (first picture) and view to the right (second picture). 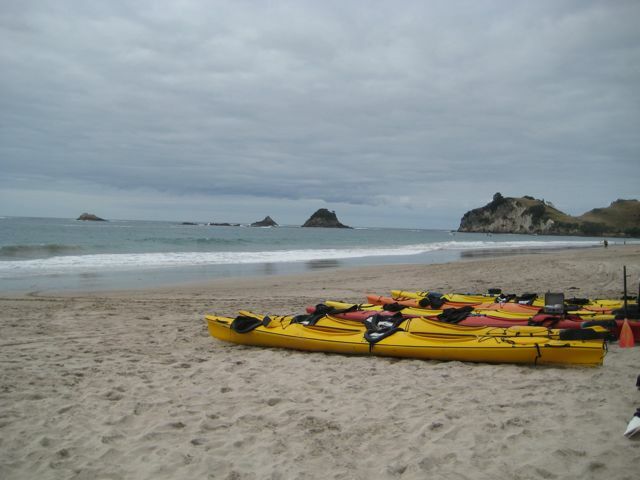 Q: How do you get a kayak from the beach through the surf out into the ocean when there are 3 foot swells? 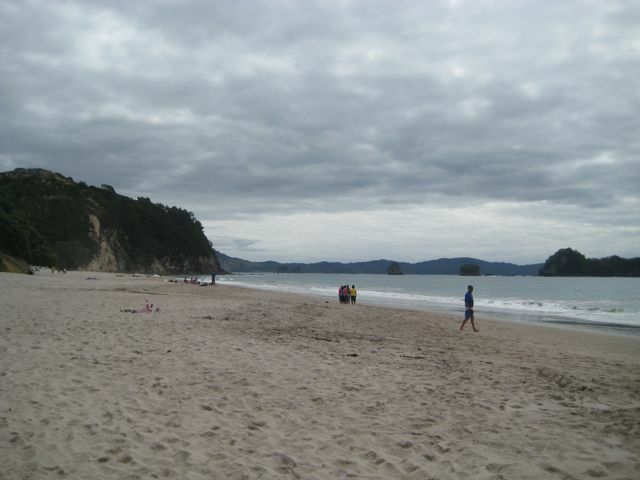 Beautiful Hahei Beach ~ Launch point for our trip. And this is a busy long weekend. 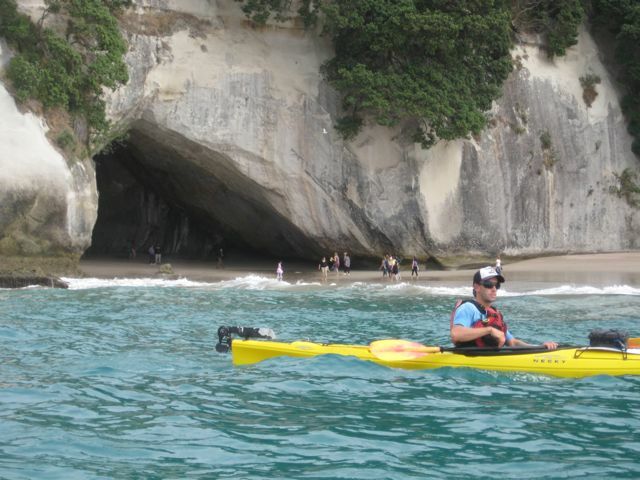 We took a sea kayaking trip to view one of the highlights of this area; Cathedral Cove. As we pulled up to the beach it became evident that there was a bit of a surf breaking on the beach. Hmmm ... so how do you get a kayak through the surf? Over it? Through it? The answer, you just keep paddling until you get to the other side. 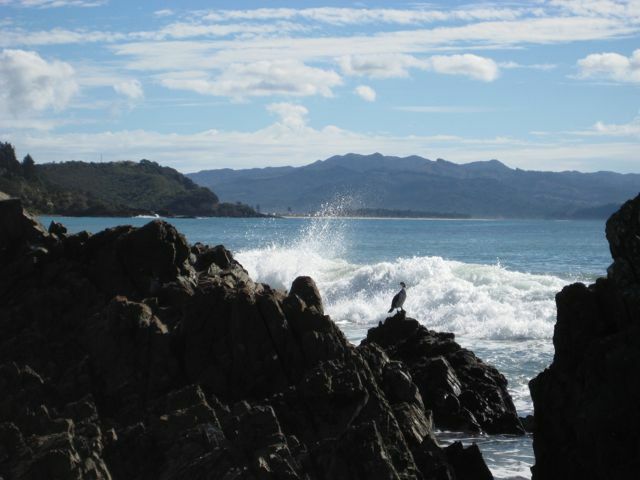 The tour operators said they would time pushing us out so that we would miss the surf. They followed that with, 'we usually are off with our timing'. I must admit I was a bit nervous about getting through the surf but it was fun. We definitely got wet, even with the skirts, but it was fun. The surf we had to go through. Not quite as intimidating in the photos as it was in person. If you can spot the person in the water it puts a little more perspective on how big this surf really was. 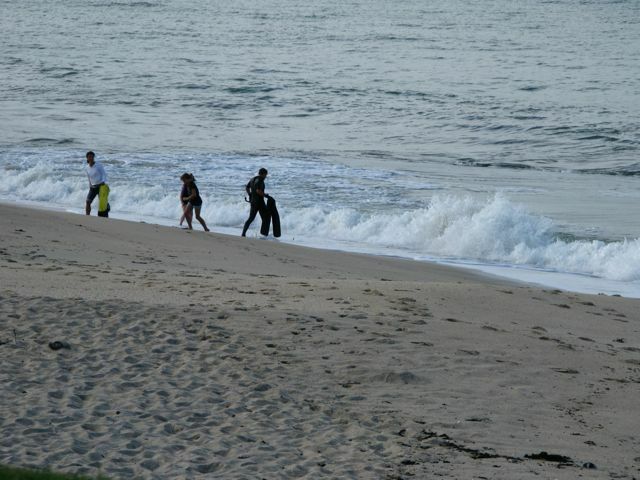 Others in our group making it through the surf. We were comfortably positioned at the buoy at this point. A little wet, but we made it! 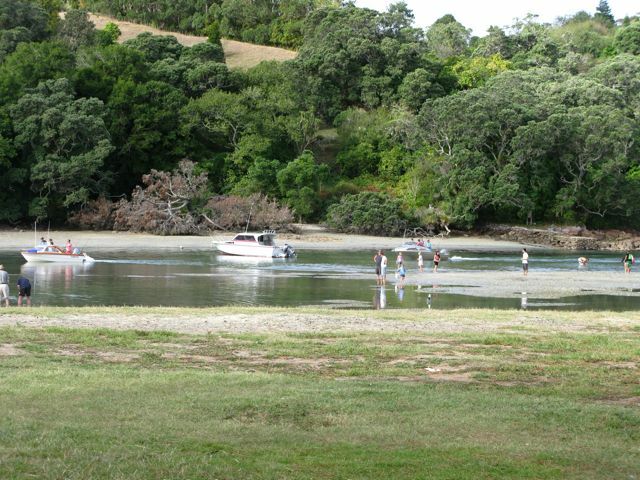 Our landing point; Cooks Beach. The landing was a bit less graceful than the launch. We ended up sideways in the surf but did another loop and made it in; not dry! 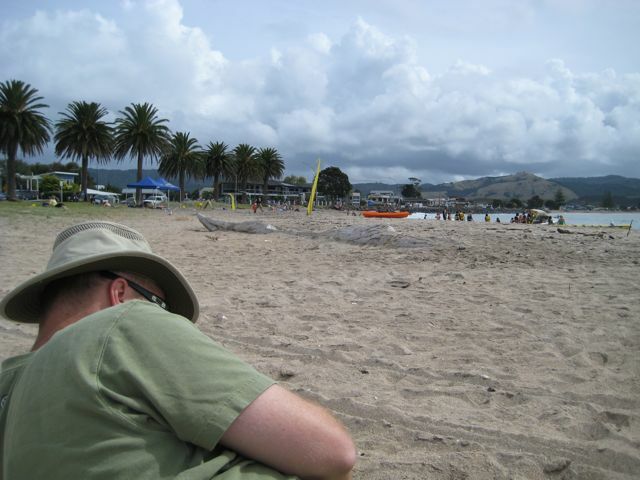 I'm surprised the camera survived since it was in the pouch of my life vest and soaked! 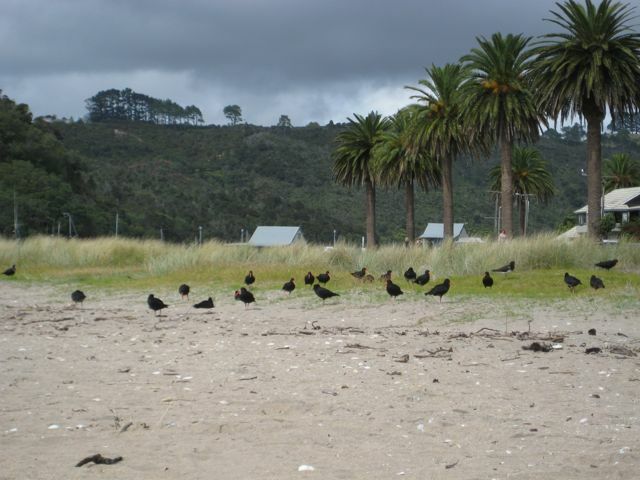 A busy long weekend at the beach with lots of people picking mussels for dinner. 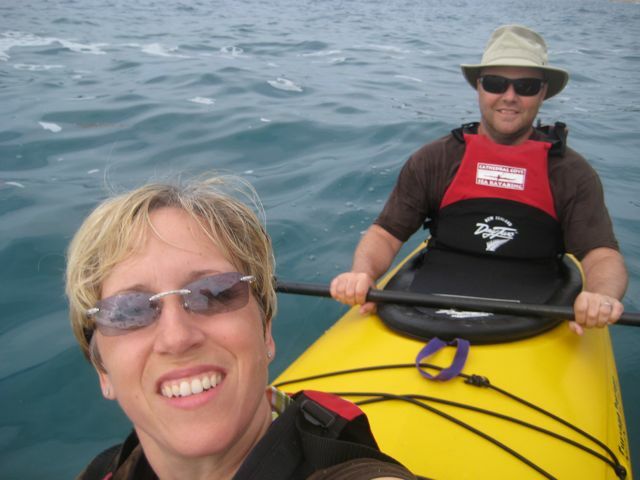 We have a bit of experience Kayaking but never in this kind of surf and not usually together. 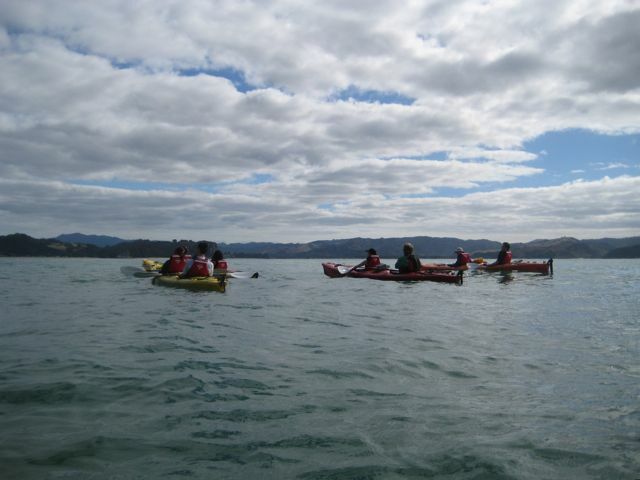 At home we have our own kayaks. Today we would have to paddle as a team. It's a good relationship test. We passed with flying colors on this one. 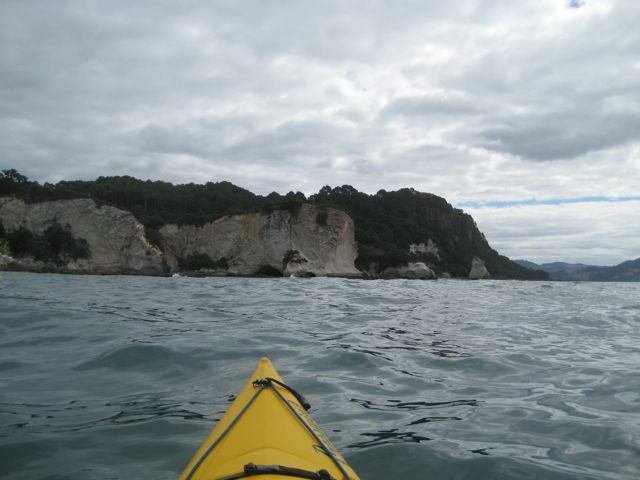 One thing I was not prepared for was getting sea sick on a kayak. Usually I don't have a problem in small boats but things seem to be changing. The swells were so big that once one came in we couldn't see the others in our group. 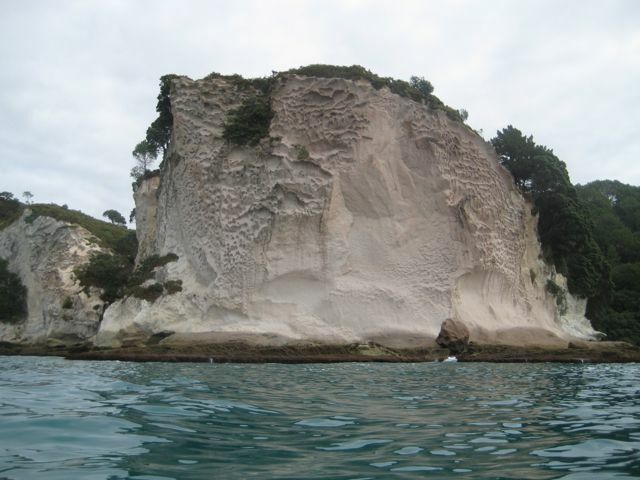 It wasn't a big deal once we got past the surf from a paddling perspective but whoa ... certainly not so from a sea leg perspective. But, I held on. 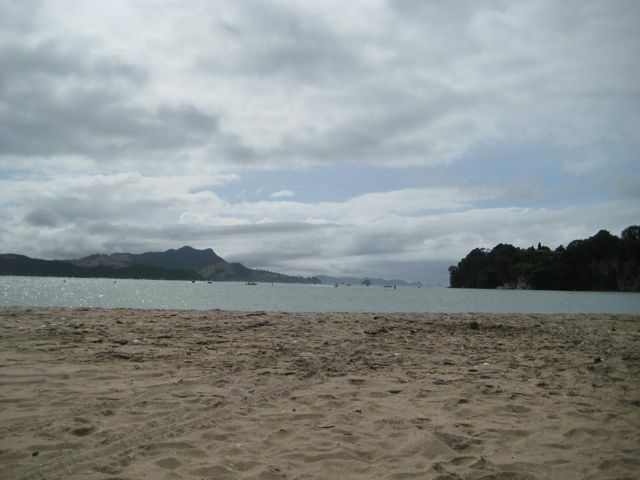 We've been in Whitianga (pr. 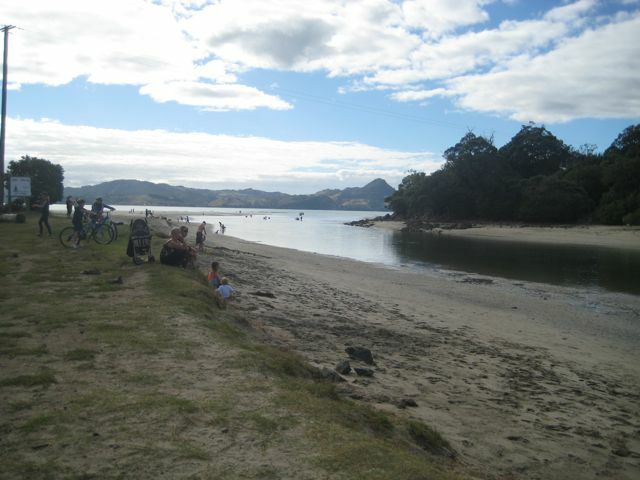 Fitty -anga) on the Coromandel Peninsula now for six days and are really enjoying it. It is great to be parked and not loading and unloading the roadlicker on a daily basis. We had the place pretty much to ourselves for the first few days but then the locals poured in for Easter Weekend. 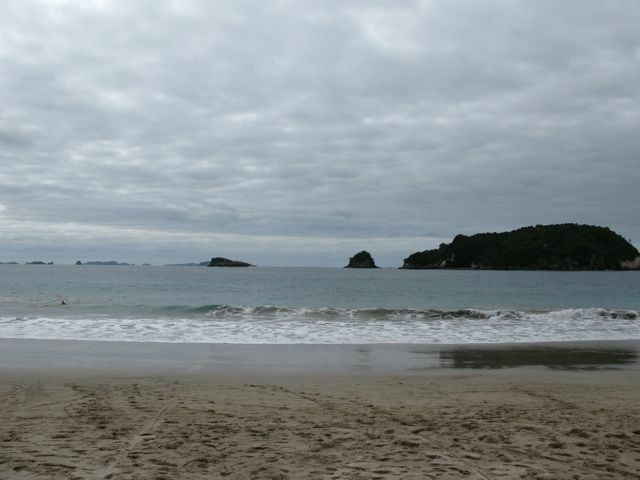 It is still amazing that in these crowds you can still find a deserted beach. We love that! 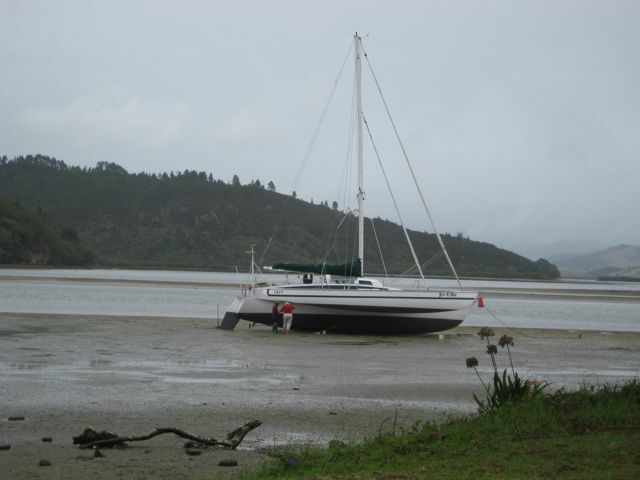 Creative Boat Washing ~ just wait for the tide to go out and bring the brushes and buckets. 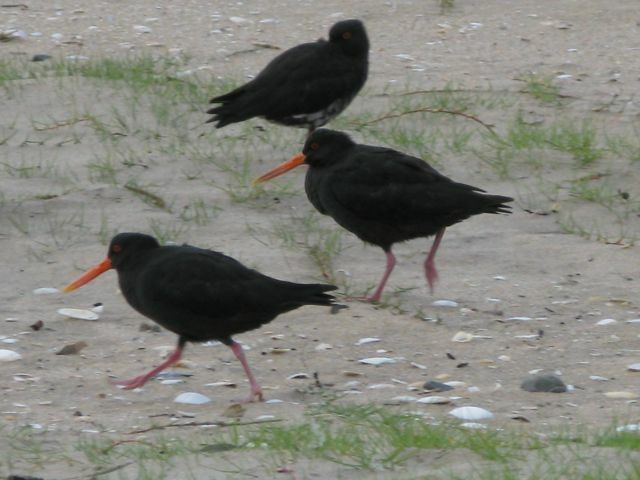 'Oyster Catchers'; somehow I don't think that is the proper name for these birds, but this is what they are called. They are beautiful and fun to watch. 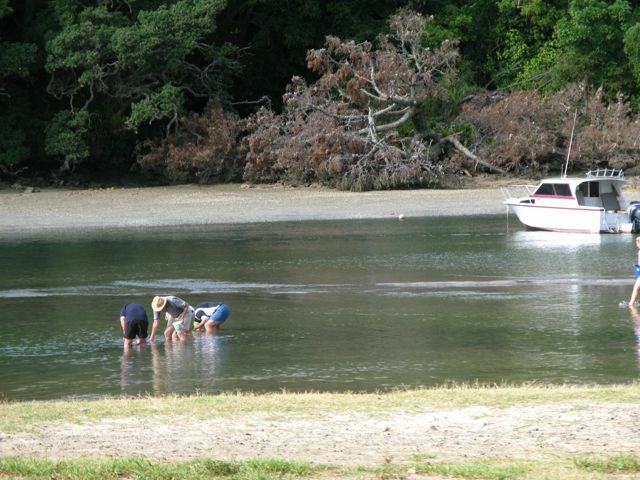 ... except this family picking mussels. 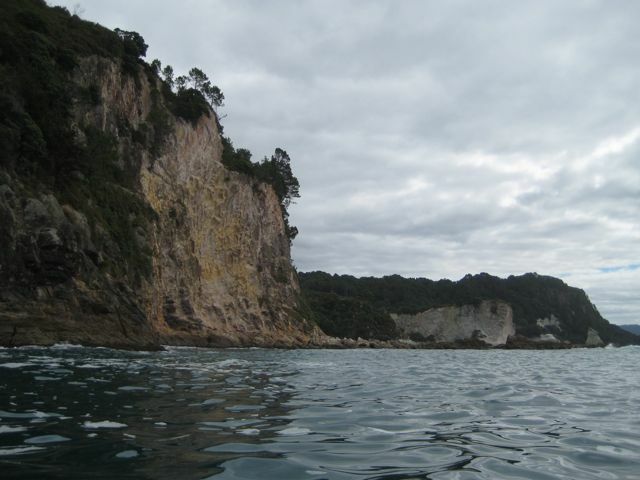 The sun peeked out for this beautiful view of Shakespeare Cliff. Hmmm ... not such a good golf day. Perhaps I should have followed the sign a little better. 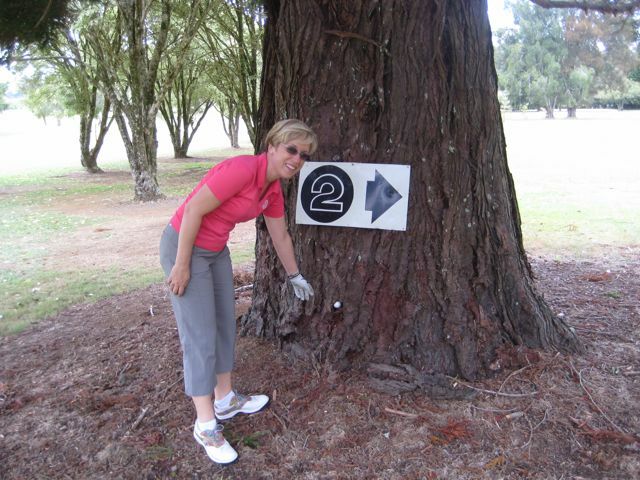 Of course Jeff could not resist snapping the shot as I retrieved my ball from the tree ~ literally. LOL! Marina activity is always good for some people watching. We laugh every time we walk past this tree. You can just hear it, 'please don't leave me. I love you!' 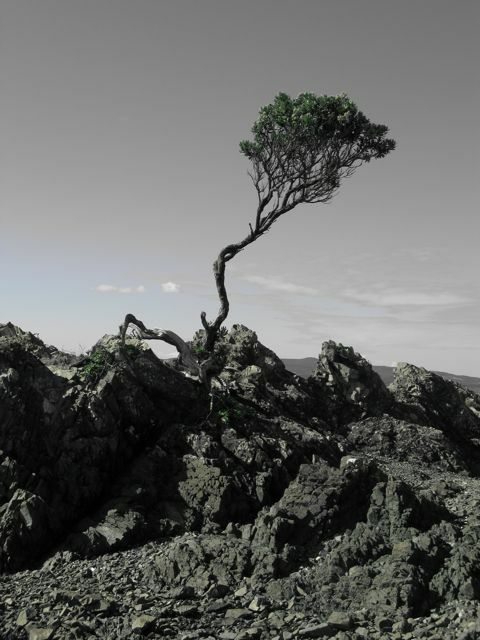 This photo should be named 'treehugger'. 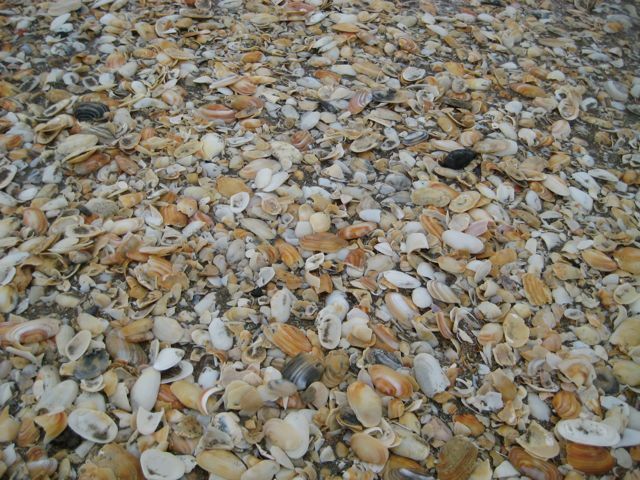 A walk on the beach often means walking across beds of shells like this. Amazing! You almost feel guilty walking across them as they crush under your feet. But, they are everywhere. And new batches are washed in with each tide. 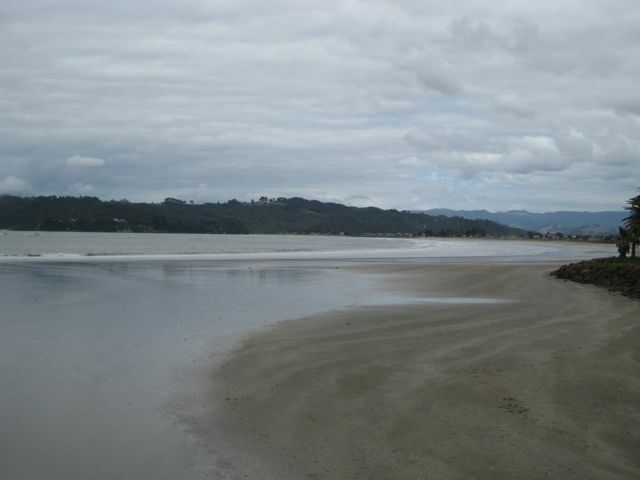 We had a great walk on the beach this day; walked about four or five miles and saw only a handful of people. It was great. 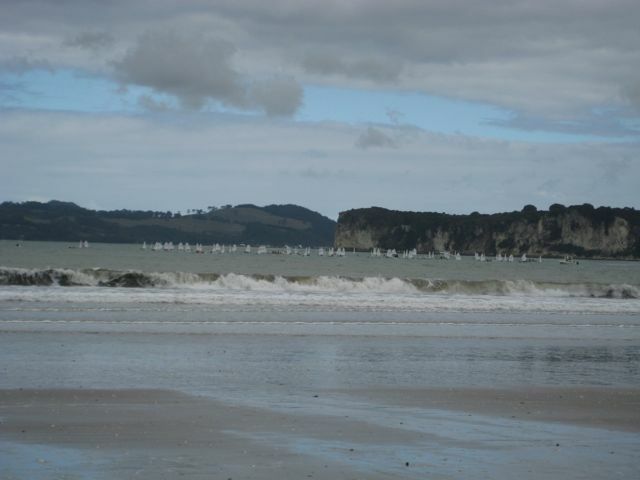 The tide was out and we were walking down to see a regatta that was underway. What's missing from this page is the video of us jumping (HA!) over the little stream left of the river while the tide was out. The video would make you pee your pants; but ... can't figure out how to load video here. ... yeah, that's it. 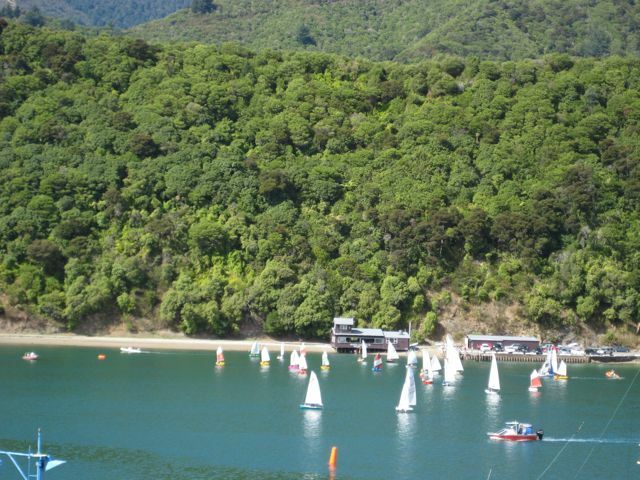 The regatta. This was just one group of boats. 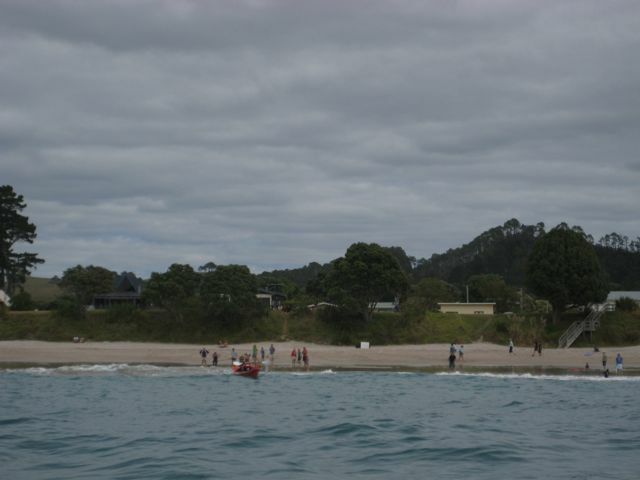 There were at least two other groups from other beaches and bays that could be seen from this spot; but not really in pics. 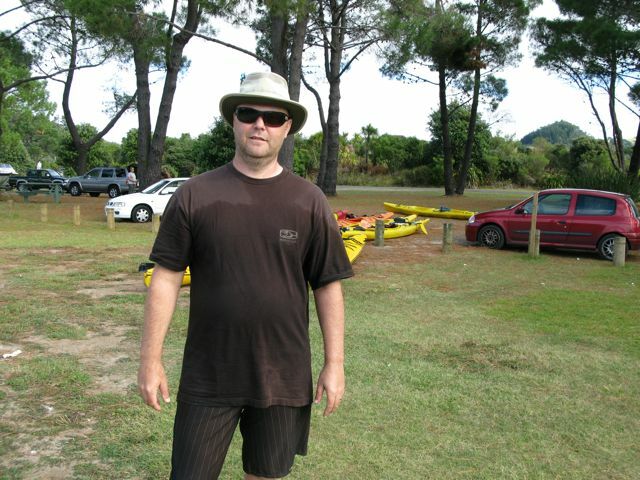 Again we were impressed by the active lifestyle of the Kiwis. We headed down this way on the beach because we could see all sorts of tents set up. We figured it was related to the regatta and expected all sorts of people selling stuff. But the tents were just for the regatta teams; littered with gear and portable grills for the after race feast. No vendors. How nice. It's just about the sport. 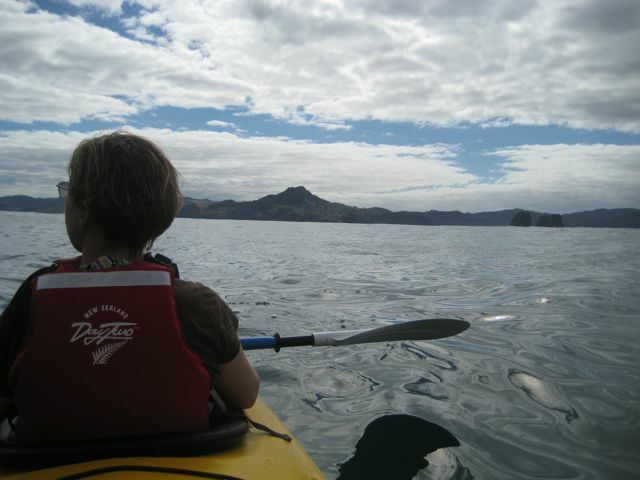 For our last day in Nelson we decided to explore the Marlborough Sounds. We'd heard such great things about how beautiful it was and were anxious to check it out. Until, that is, we started down the roads. These roads finally put me over the edge. They were so windy and narrow ... and crumbling on the edges. There was barely room for one and a half cars, never mind two. The moment we came face to face with a big logging truck I lost it. I was terrified. We had to scoot over to the very edge of the crumbling road to allow the truck to pass. The only saving grace was that we were on the inside lane. If we fell off we would fall into the hill. If he fell off he had a looong way down. Poor Jeff. He did a great job of using up every speckle of roadway to let the truck by safely. But I was done. I was ready to turn around and go back but there was no way I was going to let Jeff turn around on this road. LOL ... easy, now that is over and history. 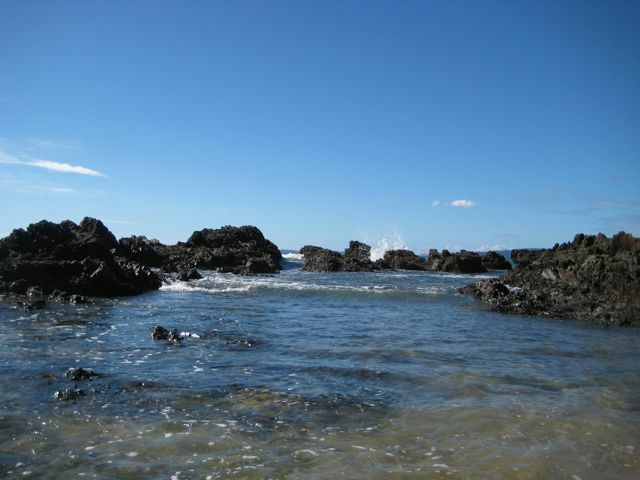 So, we continued on past Okiwi Bay to Elaine Bay where we had set out to explore. Given the chance to go back down the roads to see these views again, I would vote, 'NO!'. That's the first time on this trip that I would say that. The views were no doubt beautiful but I encourage you to see them through others' eyes and not through the windshield. And this is one of the few spots where there were trees on both sides of the road instead of a big cliff. No way I was taking a picture while near a cliff; both hands were tightly gripped to the seat for those! Hee hee. Argh!!!! Oddly enough the car doesn't get any narrower when you hold your breath. Also, don't get the wrong impression. 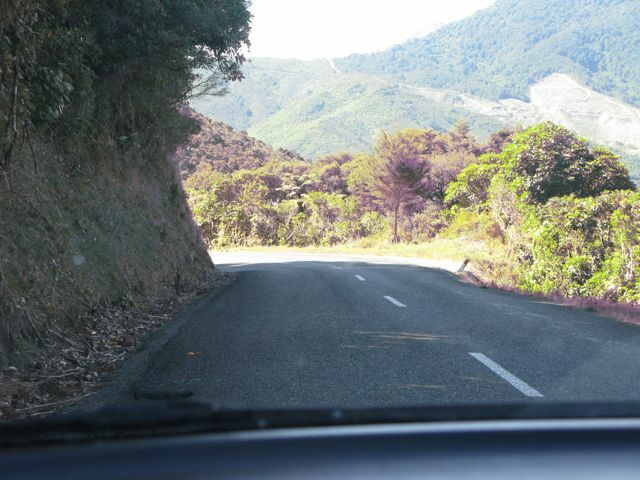 The Kiwis take very good care of their roads. They are working on every one of them. They just have a completely different level of comfort on these roads than someone who grew up where a speed bump is the biggest hill you might see in a day. 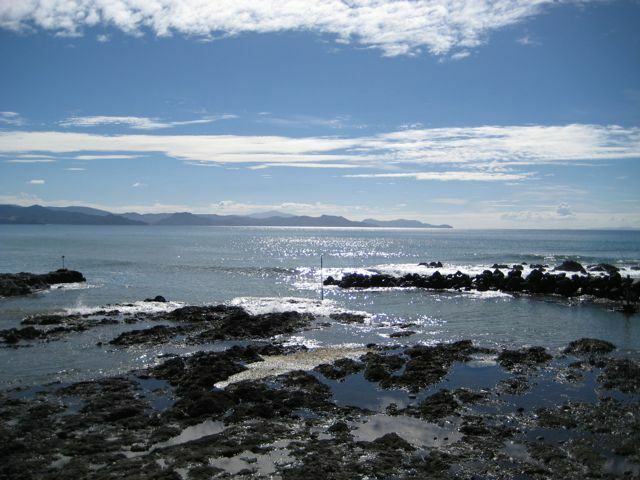 Okiwi Bay; still worth it at this point. Being silly trying to get the 'camera on the car with timer' photo. And finally ... the shot. We continue to take these ourselves simply because we're usually the only ones around. Large crowds are definitely not a problem in NZ. 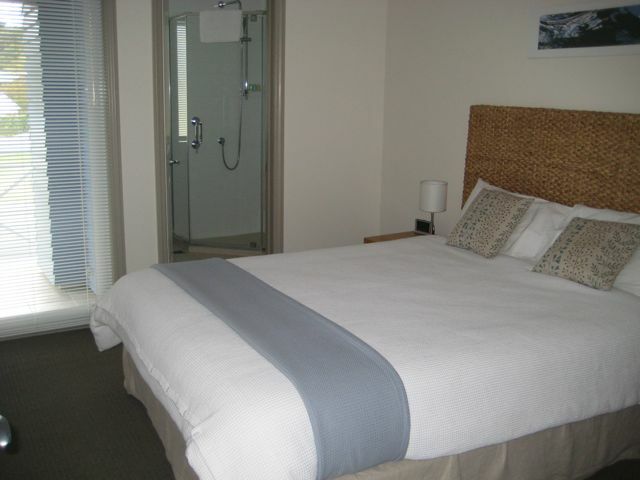 Elaine Bay; not worth it. 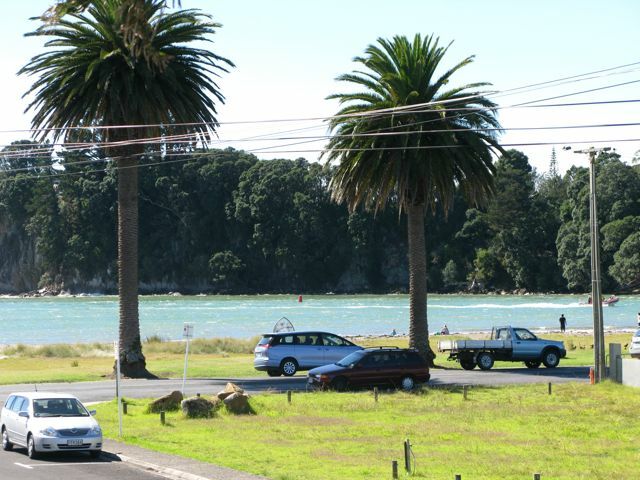 No offense to those who call Elaine Bay home. It is beautiful. But the road there was just not worth it for me. I'm sure Jeff would say the same. LOL! Maybe they do it on purpose. 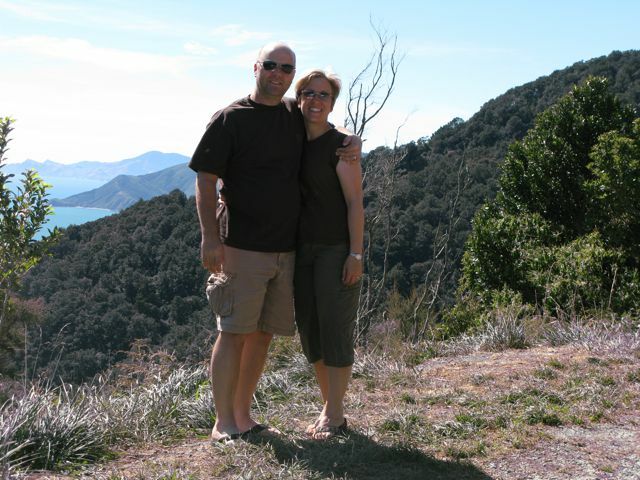 As we headed back to Nelson we had reached a new point in our trip. We were ready to come home. 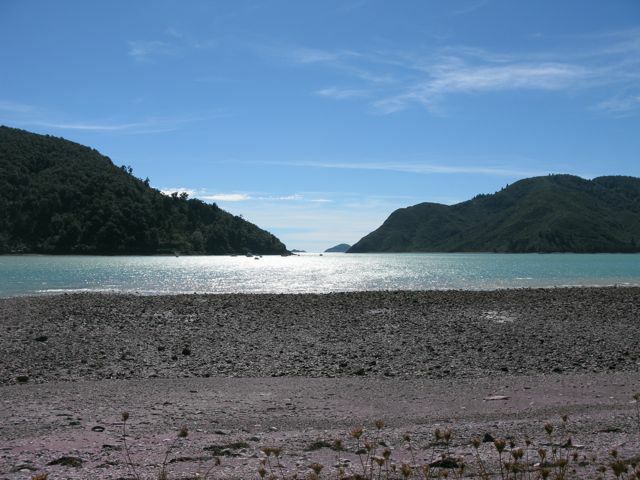 Our trip to Nelson and through the Marlborough Sound had brought us full circle around the South Island. 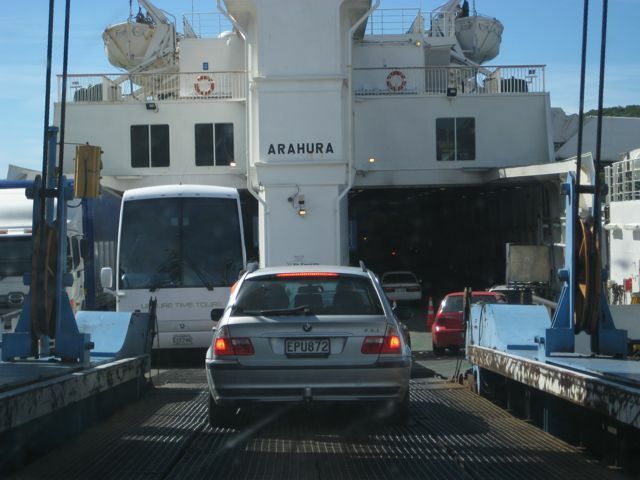 The only place left to go was across the ferry back to the North Island. For us, done is done. The trigger had flipped. Done. We even got to the point of trying to change our return flights and come home early. 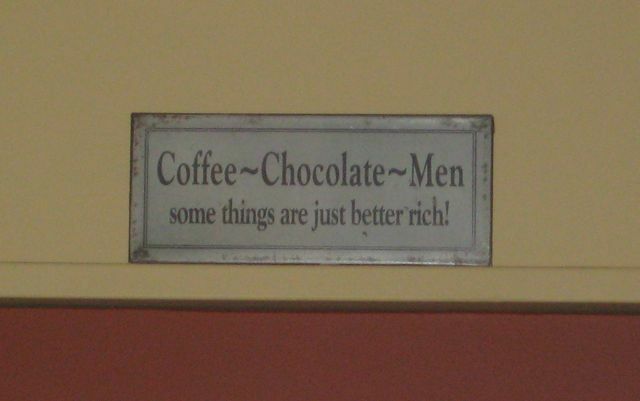 But, the cost of a really great deal on plane tickets is that they are effectively unchangeable. Despite being a bit homesick we were not willing to pay the outrageous fees to make the change and come home. We weren't going to give up. So, another plan. 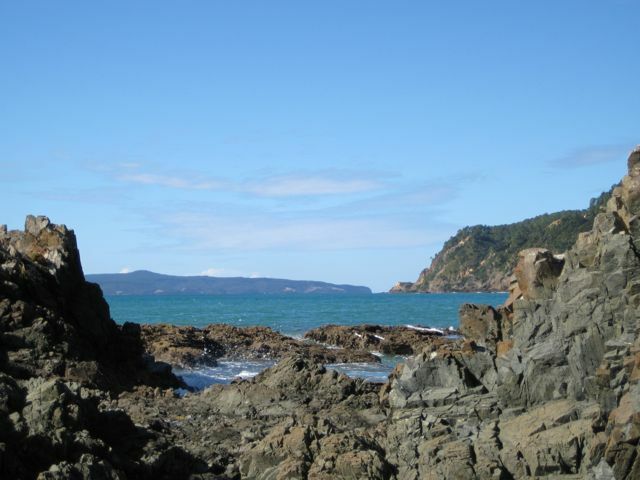 On the way down the North Island we skipped an area called the Cormandel Peninsula; just a few hours from Auckland; Kiwi cottage country. 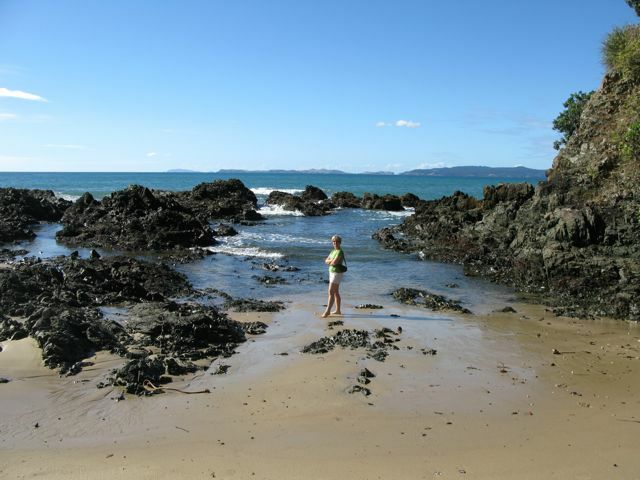 An Australian couple we met in the Bay of Islands said that the Coromandel Peninsula was way better. 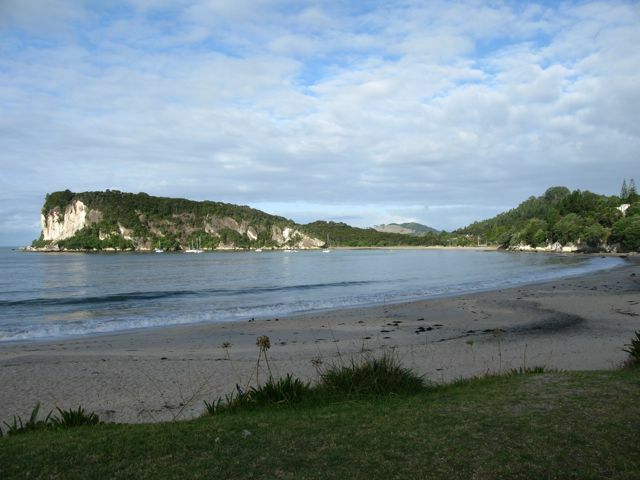 The Bay of Islands was one of our most favorite spots; so we decided we would head to the Coromandel Peninsula and find a place to park and stay for the rest of the trip. I was discouraged by my online search. I couldn't find anywhere that fit the bill and got good traveler reviews. So, we decided to risk it and just drive in. 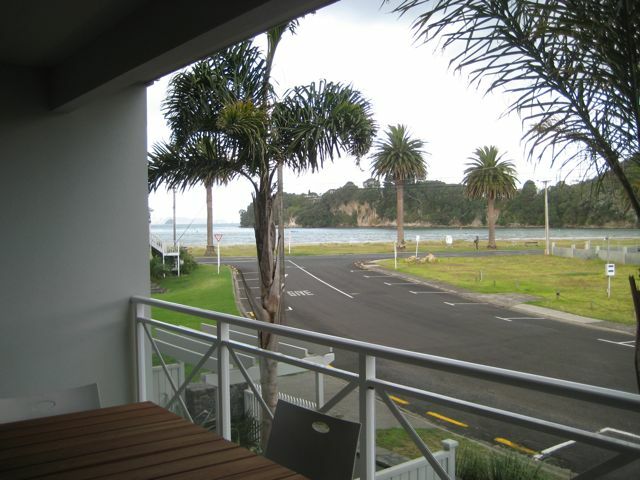 This was a bit risky since this is where Kiwis go to vacation and we were approaching Easter weekend; a four day weekend here. So, we booked our ferry crossing and mapped a road that would get us there as quick as possible. 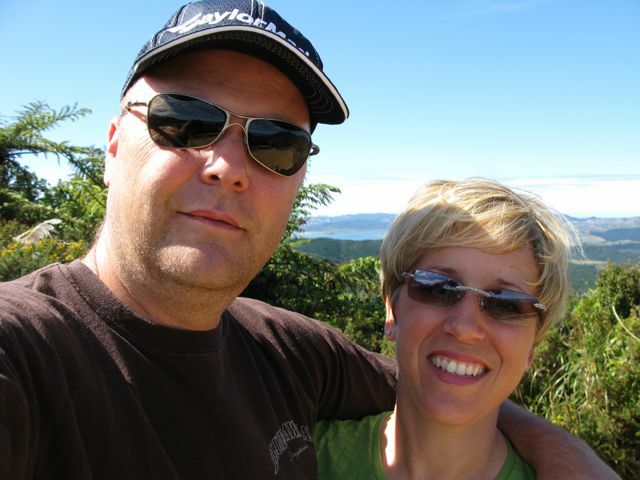 We had a great day for the ferry ride back to the North Island. Yay! And we brought with us an attitude adjustment now that we knew we surely weren't going home early. I know that might sound crazy, but we were tired of being vagabonds. RV'ing is one thing; living out of the back of a Corolla is another. 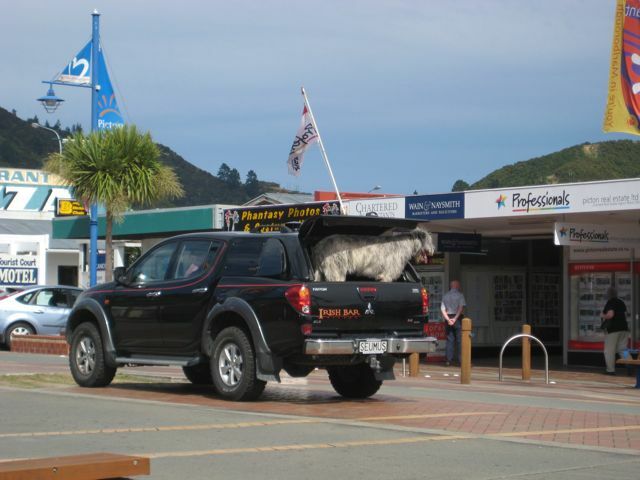 Here are some funny shots from Picton as we waited for the ferry. The biggest dog I have ever seen! After a good night sleep we had a new change in plans. 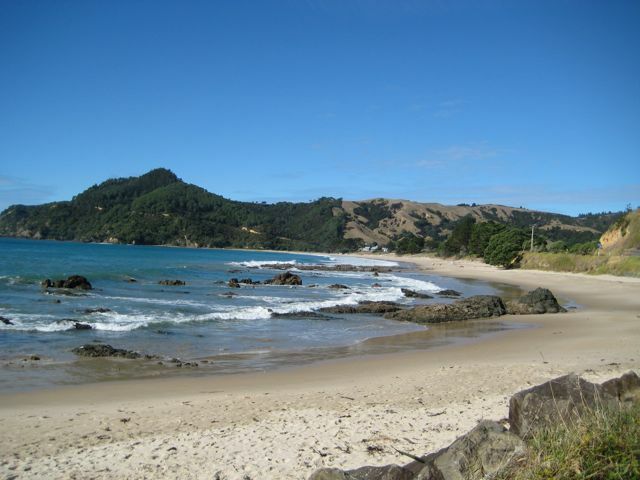 Rather than take the shortest route to the Coromandel Peninsula we would drive up the west coast of the North Island. 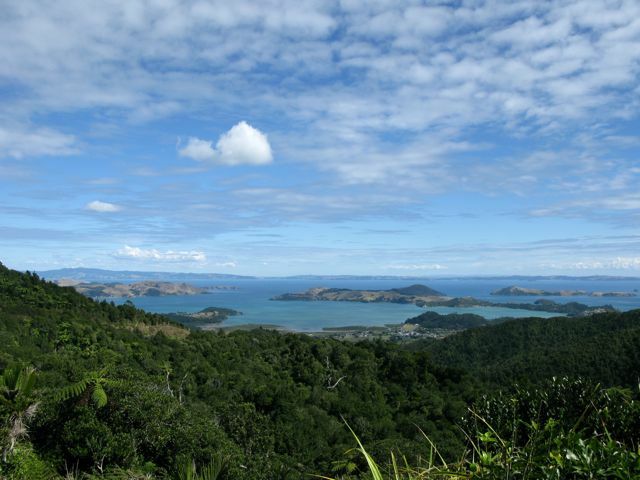 We hadn't done that on the way down and even though we were told there wasn't much to see it added only a few hours to the trip and we would arrive in Coromandel on the same day. 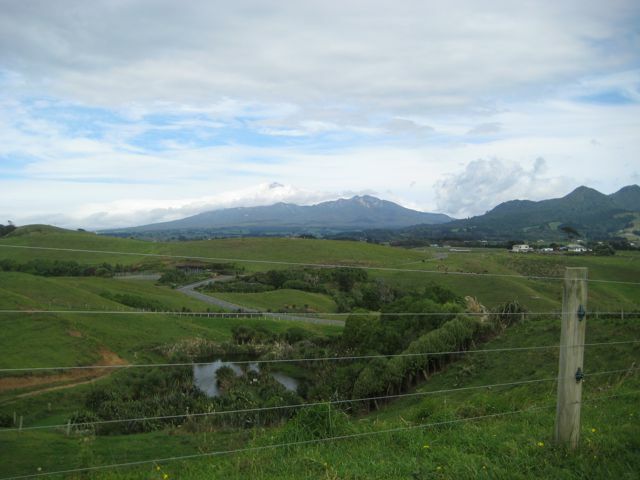 So, we headed up the 'Surf Highway' which would take us around Mount Taranaki; an active but dormant stratovolcano. 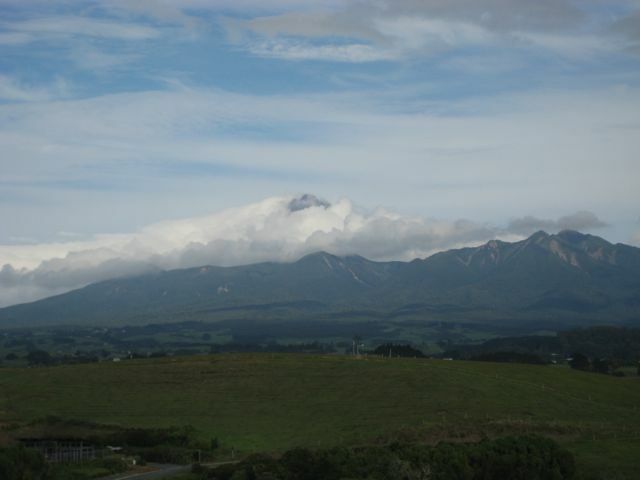 Stratovolcanos are characterized by a steep profile and periodic, explosive eruptions. 'They' say this one is overdue. Hmmm ... we've been here for tsunamis, tidal surges, huge windstorms in Milford Sound which stranded the group behind us for 3 days due to damaged roads, and an earthquake in Napier (after we had left). Maybe we should stay away from the volcano ... naaaahhhh!!! Had to see it. They weren't kidding about steep profile. We drove completely around the volcano at pretty much sea level. Unfortunately another cloudy day gave us only this view. Our perspective was better than the photos portray. It was impressive. 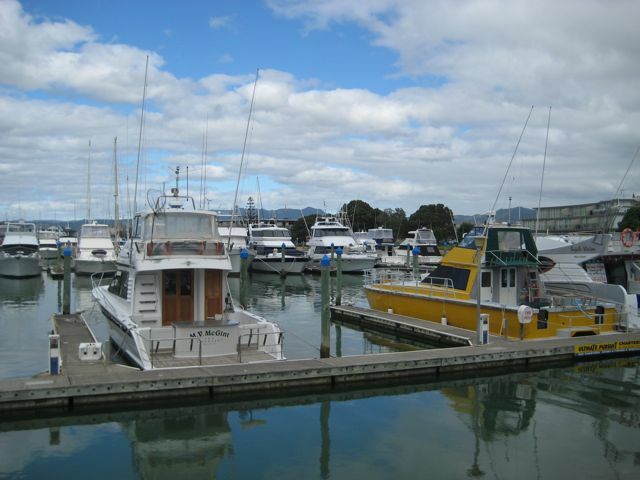 We continued on to Hamilton which would be our last stop before Whtiianga on the Coromandel Peninsula. Funny, everyone we spoke to said Hamilton was dull. 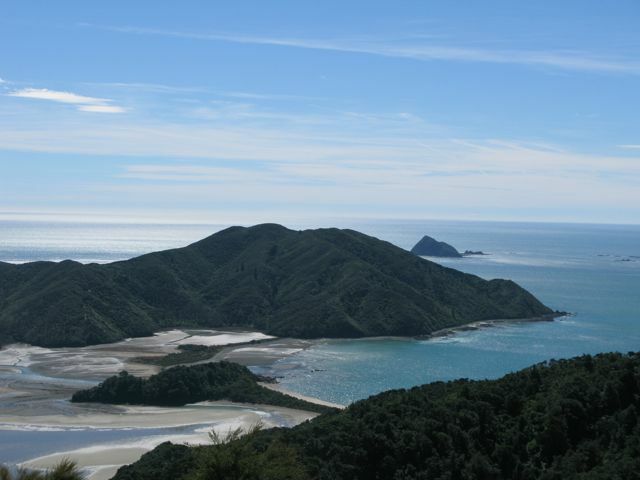 Even an article we read in the paper stated, 'Kiwis still try to figure out the difference between being in Hamilton and death'. We laughed that we would likely roll through Hamilton and love it. ... But, nope, 'they' were right on this one. Not much in Hamilton. There were some pretty parts of the town but nothing worth sticking around for. 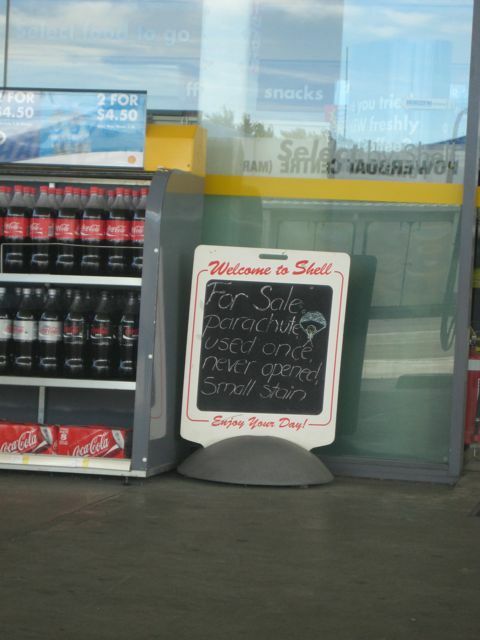 We made a bit of a mistake while in Hamilton too. We hadn't had any Mexican food since we arrived in New Zealand. Quite frankly haven't seen many Mexican restaurants. Rather than taking that as a good hint that Kiwis are not experts in Mexican cuisine we decided to jump right into the one we saw in Hamilton. As we sat down we realized we had probably made a mistake. The 'chips' and queso that were brought to the table were Doritos; new to New Zealand. We chuckled. Then we joked that our food might come from the Old El Paso taco kits you can buy in the grocery store. We joked too soon. That is exactly what we got! And! It cost us a fortune; one of our most expensive meals yet. We were gracious to the hosts but laughed our butts off as we turned the corner. We should have known better. ... Whose up for Mexican when we get back!? 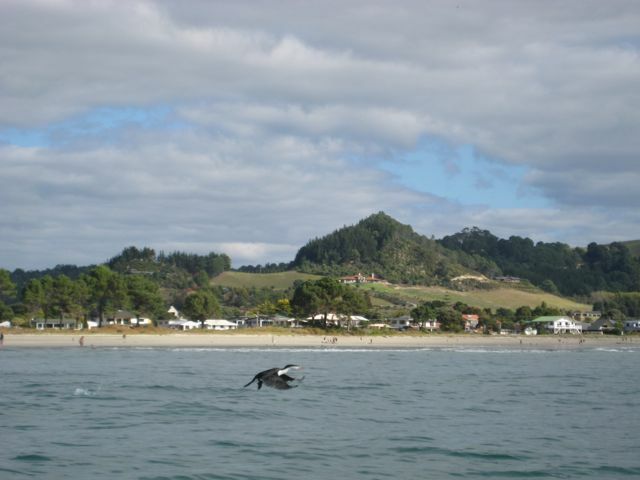 The following day, with our attitude adjustments slightly damaged we headed for Whitianga; our destination town on the Coromandel. What a wonderful surprise!! 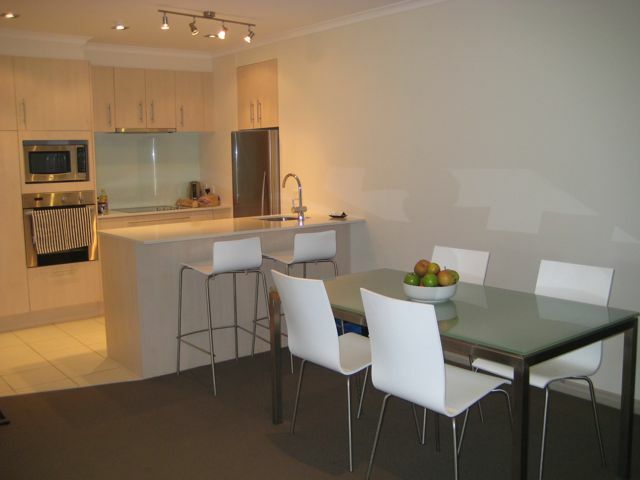 We found ourselves a great apartment with a great location and view of the ocean. 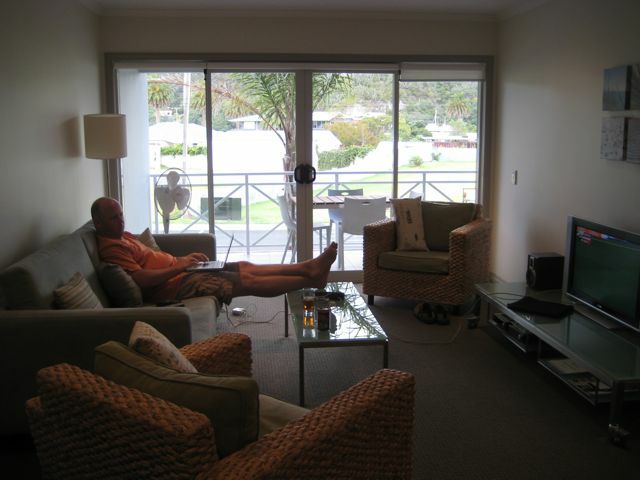 We booked it for the remainder of our trip and here we sit on our SOFA watching our FLAT SCREEN TV while the WASHING MACHINE is running and the dishwasher does its job after our HOME COOKED meal following a day on the ocean. Ahhhhhh ..... Just what we needed. A place to park and call home for a while. Oh, and lest we forget that old faithful needed a little TLC too. The culprit ~ a sliver of metal. 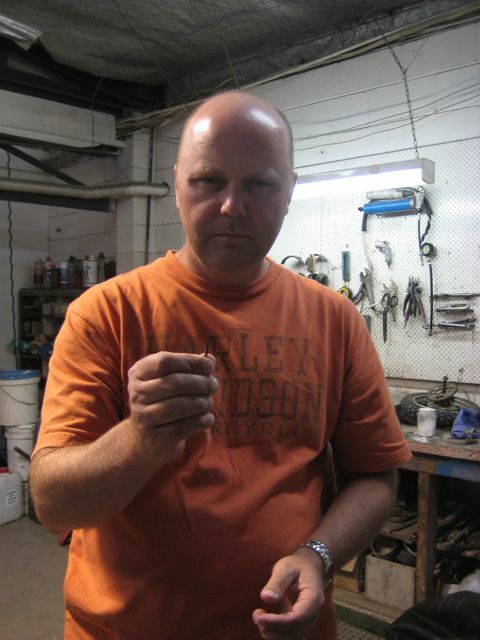 But, no worries, we had the fastest, cheapest tire repair in history. And ... still in one piece.